Chauri Chaura is situated in Lat. 26 Degree 38' N. and Long. 83 Degree 35' E. on the State highway between Gorakhpur and Deoria, 26 km. from Gorakhpur. It has a railway station which is 25 km. south-east of the Gorakhpur railway junction. Prior to abolition of zamindari the village was held by Sikh zamindars of Dumri (Gagaha), who established a bazar near the railway station and made the place a local commercial centre of hide trade. Adjoining Chauri Chaura on the north is Mundera Bazar, another flourishing market. Chauri Chaura came into prominence in 1922 when its inhabitants whole-heartedly participated in the Non-co-operation movement started by Gandhiji. In February 1922 on hearing that the sub inspector of Chauri Chaura police-station had assaulted some of the Congress volunteers at Mundera Bazar, an infuriated mob assembled before the police-station Chauri Chaura in February 4,1922 demanding explanation from the guilty official. It ultimately resulted in police firing killing 3 persons from crowd and several injured. After the police had exhausted their ammunition and went inside the police-station, the enraged crowd challenged the policemen to come out of their den and on their paying no heed, it set fire to the thana in which 23 policemen including the station officer were burnt alive. Consequently, Gandhiji suspended the Non-co-operation movement. The people of the district did not forget their freedom fighters. 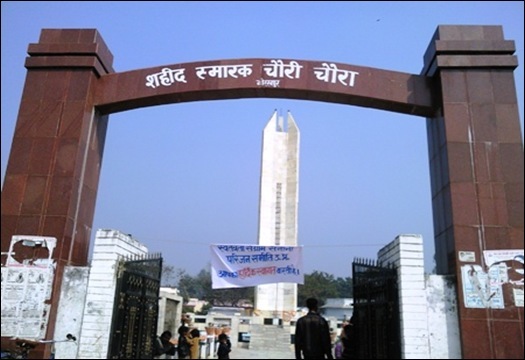 In 1971, they formed Chauri Chaura Shaheed Smarak Samiti. In 1973, this Samiti constructed near the lake at Chauri Chaura a 12.2 metres high triangular minaret on each side of which a martyr is depicted hanging with a noose round his neck. The minaret was built at a cost of Rs 13,500 generously contributed by the people. Later another Shaheed Smarak (now it is the main Shaheed Smarak) was built by Government of India to honour those hanged for Great Freedom Struggle. This tall memorial has names of those hanged engraved. Railways also introduced 2 trains to honour martyrs. These trains are Shaheed Express and Chauri Chaura Express.